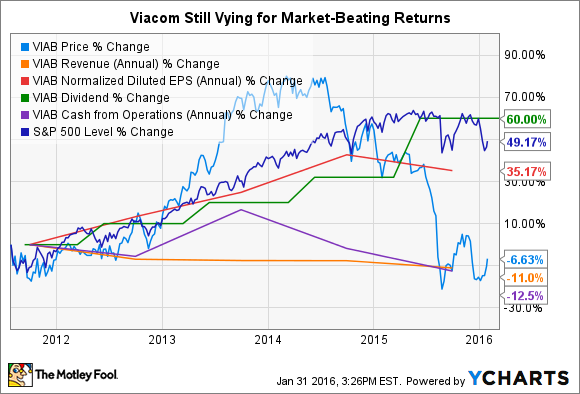 Will Viacom Raise Its Dividend in 2016? Yes, but not nearly as much as it might have in years past as business and financial headwinds take a toll on the stock. Teenage Mutant Ninja Turtles: Out of the Shadows opens on June 3, 2016. Credit: Paramount Pictures. Dividend-paying stocks tend to do better than their non-paying peers. Stocks that raise their dividends regularly do even better. Massive dividend increases despite lower cash from operations. Reducing its shares outstanding has helped control dividend costs. Still, increasing the per-share dividend commitment by 60% even as cash from operations declines 12.5% suggests cuts are coming. It's just a matter of time. Huge stock underperformance versus the market. Just as winning stocks tend to keep on winning, losers tend to keep on losing. That's especially true if the decline is precipitated by deteriorating business conditions. Here, declines in both revenue and cash from operations suggest there's plenty to be worried about. After many award-winning years with Jon Stewart behind the desk, Trevor Noah now leads Comedy Central's news parody. Credit: Comedy Central. How bad is it really? That's tougher to say. All we know for sure is that Viacom's TV and film business isn't as sturdy as it used to be. First, in movies, Viacom's Paramount Pictures sold just $674.7 million in tickets at the U.S. box office in 2015. Sound big? It's not: Only twice between 2010 and 2014 had the studio's films earned less than $1 billion in combined domestic grosses: $914.4 million in 2012 and $966.9 million in 2013, Box Office Mojo reports. Second, in TV, Viacom is parent to a variety of cable properties, including Comedy Central, Nickelodeon, and layoffs-plagued MTV Networks. Bloomberg Business quoted a summer 2015 report from Nielsen that showed ratings plummeting at most of these networks. MTV, in particular, was down over 20% across all demographics and 25% in the key 18-to-34 demo that big-ticket advertisers covet. Despite the troubling trends, Viacom investors will see a dividend increase in 2016, though it won't be nearly as big as some might have hoped. Historically, the studio tends to find dividend increases in January. Last month, management elected to keep the per-share payout where it was -- at $0.40. Keeping it at that level the remainder of the year would put the 2016 payout at an even $1.60 a share, a 4.6% increase over last year's $1.53 per stub. Not bad, but certainly not a traditional increase. Call it a de facto increase instead, a predictable move for a studio that needs as much cash as it can gather to fund new film and TV franchises and reignite long-lost growth. Do you agree? Disagree? Keep the conversation going in the comments section below.